Carbon dioxide (CO2) fixation has received a large amount of research interest in recent years, with varied approaches and success. One approach of particular interest to our research lab was the coupling of an electrochemical water-splitting reaction with microbial CO2 fixation to achieve enhanced output of commodity chemicals with minimal energy input. In this system the microbial CO2 fixation relies on the electrochemical production of H2 gas as the source of reducing equivalents. Unfortunately, H2 is poorly soluble in the aqueous system, imposing a limit on the throughput of the system. Herein, we report the use of perfluorocarbon nanoemulsions to enhance the delivery of H2 to the microbes for an overall improvement in device throughput. The topic of CO2 fixation has been widely studied in recent years, with numerous advances made in photocatalytic, electrocatalytic, and biological fixation methods. One intriguing approach to CO2 fixation uses a two- chamber set-up to combine electrochemical water splitting with microbial CO2 fixation for enhanced efficiencies and overall output. One drawback of this system is that the rate determining step is the transfer of reducing equivalents of H2 to the microbes and the amount of H2 available to the microbes is limited by the solubility of H2 in the aqueous environment. When approaching a solution to this limitation we looked to our neighbors in the lab across the hall, that of Professor Ellen Sletten. Her lab’s work consisted of using perfluorocarbon (PFC) nanoemulsions for various applications. PFCs are known to have gas solubilities that are much higher than aqueous solutions and with the help of a surfactant they can be stabilized in a variety of different buffers. We proposed that adding these PFC nanoemulsions to an electricity driven microbial CO2 fixation system would increase the supply of the H2 reducing equivalents leading to higher device efficiency and output. Fig 1. 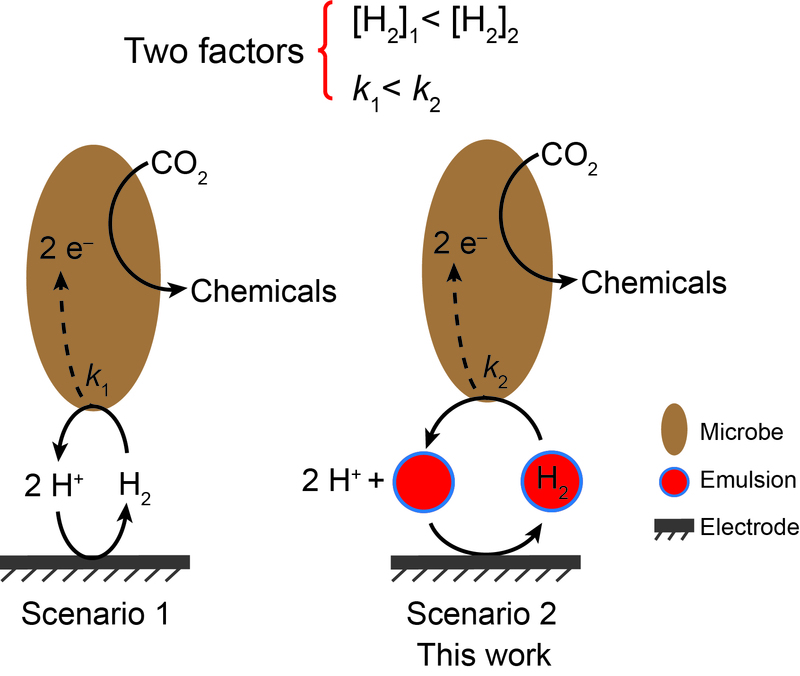 Previous (Scenario 1) and current (Scenario 2) reaction schemes for the cathodic reaction chamber in the electricity driven microbial CO2 fixation. We used the acetogenic bacteria Sporomusa ovata as our CO2 fixing microbes and we had determined that a 2.5% (v/v) of the PFC in the nanoemulsion would be ideal for our system. We started with a moderate current density of 1.0 mA/cm2 when we began our electrolysis experiments. All our initial tests were working well, and we were getting consistent results. Additionally, our hypothesis seemed to be correct, we were seeing an increase of over 20% in the Faradaic efficiency with the PFC nanoemulsions present. However, we needed to run more experiments at both lower (~0.5 mA/cm2) and higher (2.0 mA/cm2) current densities to observe the effect that current density has on the efficiency and output. If our hypothesis was correct then at higher current densities the difference in output and efficiency between the reactors with and without the PFC nanoemulsions should be larger, but at lower current densities they should be more similar. We chose to start with the smaller current density, and as suspected the outputs and efficiencies with and without the addition of the PFC nanoemulsion were nearly identical. With two successful current density trials performed we moved on to a high current density of 2.0 mA/cm2, unfortunately, all reactors (with and without the nanoemulsions) failed to reach over 30% Faradaic efficiency and even struggled to maintain the attempted 2.0 mA/cm2. We tried everything that we could think to solve our problem, but it wasn’t until Dr. Liu revisited an old homework assignment he had given his students that he came up with a new theory. As a larger voltage is applied for a solution of a given buffer concentration at a specific current density the pH of the system will rise as the buffer is consumed and instead water is acting as the system buffer. We were able to able to determine that the ideal buffer concentration to reach 2.0 mA/cm2 was 40.6 mM (over 2 times the original concentration of 18.5 mM). Using this larger concentration of buffer, we were finally able to get reproducible results at 2.0 mA/cm2 that furthered our previous conclusions. When I started research I had heard how debilitating failure could be, but I hadn’t quite experienced that until we reached this impasse. The frustration with the research, particularly after it had all been working for so long, was hard to overcome. It seemed like every time we had finally figured out the problem and tested it, it still did not work. However, we kept reading and thinking and, in the end, we found the solution that allowed us to continue our research. In continuing, we found that the PFC were not only able to enhance the gas solubility of H2, but they also demonstrated faster rates of transferring the H2 to the microbes for improved conversion rates of CO2 into acetic acid. We believe that this discovery could allow for enhanced throughput in other electricity driven microbial fixation systems where small molecules, like N2 or CH4, are poorly soluble in the aqueous solution. You can read more about our work in our Nature Catalysis paper here.